UNITED NATIONS, September 23 -- When Ecuadorian President Rafael Correa held a stakeout at the UN on Friday night, most of the questions were taken in advance, about the pay-to-not-drill environmental project Correa was promoting. Inner City Press did not pre-register any question or itself, but rather sought to ask the old fashioned way. As the last question at the stakeout, Inner City Press asked Correa about his relations with the United States, and more locally with Union City, which barred him from appearing in a high school. Correa mocked the mayor "whose name I don't know." Inner City Press said, "Brian Stack." 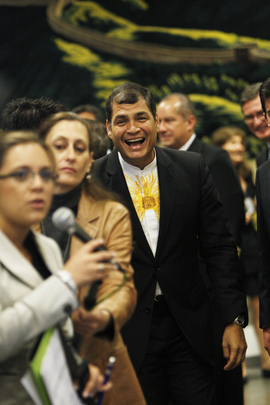 Correa repeated the name, then sarcastically said he would hire him as a publicist, since banning the talk gave rise to more stories, including in Ecuador. Still it is rare from the UN General Assembly to cause any local ripples beyond traffic, so that question had to be asked. As to the United States, Correa said that while he had expelled the US Ambassador and the US followed suit, now new envoy had been nominated, and even during the standoff commercial relations continued "almost intact." Now these relations including payments through UNDP not to drill. We'll see.